Our shuttle service from Eilat to Ovda Airport is the most convenient way to the airport! The service is coordinated for flights departing Ovda Airport, with pickup from Eilat hotels approximately 4 hours before flight departure time. Journey time to the airport is approximately 45 minutes to 1 hour. Israeli airport regulations state that passengers should arrive to the airport approximately 3 hours before flight departure in order to clear security checks so our pickups will provide you with plenty of time to clear security at Ovda Airport. The transfer is undertaken by our modern air conditioned vehicles with multi-lingual drivers and assistants. 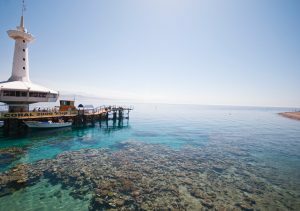 Pickup in Eilat is available from all hotels across the city’s various hotel areas. Eilat Shuttle offers a cheap and easy bus from Eilat to Ovda Airport, price from $8 per person. Price is including pickup from the door of your hotel, luggage, all booking and credit card fees, and free time or date change. The shuttle time is coordinated for each low-cost flight from Ovda meaning you will be at the airport with plenty of time to clear security as per the Israeli Airport Authority regulations. Simply book at our website and wait at the selected point according to the instructions with your voucher (either on your phone or printed). Our rep will welcome you aboard one of our modern air conditioned buses and you will soon be at the airport for your flight.